I am a recently retired urbanist and traffic and transportation planner. Wherever possible I am riding my bicycle, whether around my neighborhood or on cross country cycles. Consequently I never owned a car, nor a drivers licence. I am member of the German Cycling Club ADFC. In the eighties I lectured technology and society of transportation at Technical University of Berlin, organised congresses and exhibitions and did research about cycling in Africa. Since 1990 I worked in the planning department of Witten, a city of about 100.000 inhabitants. 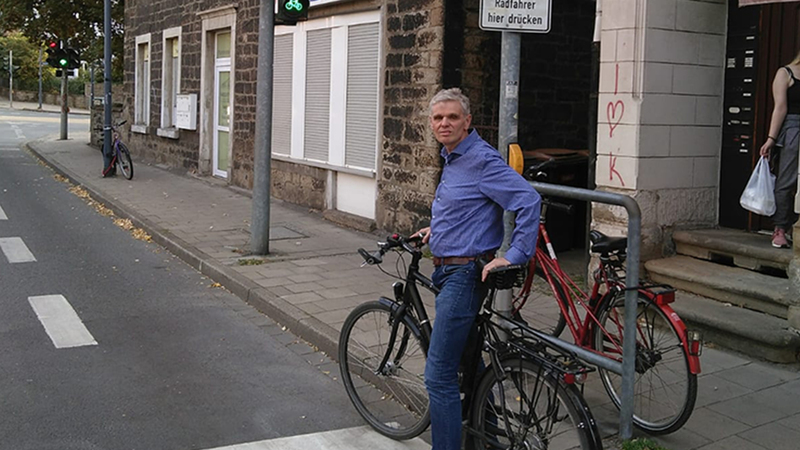 To increase daily cycling journeys in Witten. What are the obstacles and challenges you’re facing? Witten has a very good network for cycling for recreation. The Ruhrtalradweg is one of the most famous in Germany. But for all day trips estimated only ten percent of the Witteners use their bicycle. My challenge is to convince them to be role models and encourage them to communicate the advantages of cycling to for their peers, possibly by social marketing. There are three big obstacles for a fast change towards cycling. On some gaps within cycling infrastructure cycling is very uncomfortable and even risky Most of these are to be closed within the next years. Witten is part of the heartland of German Industry, So there is a silent but offensive disregard of climate change in public. Many Witteners consider cycling to be as uncomfortable as it was fifty years ago. So they fear hills as well as rain. My first step is to focus on students riding to school. I will find out all possible stakeholders to whom I can work with. One prominent partner is the children and youth parliament in Witten. Witten is a typical medium-sized, industrial city that could be suitable for cycling. So my experiences may be helpful for many cities. The strategy to involve peers and using social media may be employed for every city.